Welcome to the original MONOGRAM SHOP. Founded in 1997 by mother and daughter, Valerie and Hadley Smith. Entering the shop is a delight to the eyes. There is a little bit of everything, all the way from serious (and pricey) gift items to whimsical pieces sure to bring a smile to your face. 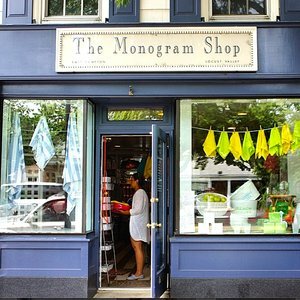 But let's not forget the purpose of the shop: monograms. You'll find beach towels and the usual resort items, but you'll also discover beautiful soaps, matchbooks, glassware, makeup cases, perfect gifts for "him," ... and the list goes on. With a remarkable selectiion of monograms, if you don't know which to choose, Valerie and her daughters will offer their help and advice. Valerie Smith, who has appeared on the "Barefoot Contessa" cooking show and in the pages of House Beautiful and the New York Times, seems to have a knack for not only what is "in" buit what is appropriate.